It would appear the art of weather forecasting has become uncannily reliable as the rain that was predicted for 2.30pm duly arrived with the referee’s kick-off whistle. Wharfedale started the half and Hoppers were immediately awarded a penalty on their own 22. Tom Davidson’s kick found touch on half way and though the lineout was lost, Hoppers were awarded a scrum just inside the Wharfedale half. Another penalty moved them down to the 20m line where a third penalty gave them a lineout on the Wharfedale 5m line. The ball was secured and from the drive the home side were again given yet another penalty. They opted for the scrum on the 5m line and from the powerful drive, scrum half James Gough darted over the line just right of the post. The position offered Davidson a simple conversion and after eight minutes Hoppers were 7-0 to the good. From the restart the home forwards worked their way, through a series of penalties, from their own 10m line back to half way. Another penalty scrum had Gough peel off and break to the visitors’ 10m line where, a minute later and to nobody’s surprise, they were awarded a penalty. The decision to go for the posts was understandable to keep the scoreboard ‘ticking over’ however the kick dropped short. Over the following ten minutes the action swept up and down the field and with eight penalties given, neither side were able to play themselves into any sort of sequence of phases to mount a concerted attack. Hoppers found themselves pressing the Wharfedale 5m line and series of moves across the field gave them advantage allowing Gough to chip the ball over the Wharfedale try line. It was collected by the visitors’ full back and play moved back to a scrum on the 5m line mid-way between the post and the corner flag. Matt Lamprey picked up the ball, drove on and passed to Ryan Carlson to score. The conversion was good and Hoppers had a commanding 14-0 lead with a quarter of the match gone. The rain, which had been steady throughout the match, decided to exert another dimension by becoming almost torrential for the rest of the half and the resulting slippery ball was frequently lost to hand by both sides. Wharfedale went down to 14 players when prop Asejevs was shown a yellow card and there was an outbreak of ‘handbags’ as Hoppers were awarded a penalty. Play was halted whilst he went off but just as the teams assembled for the scrum it appeared that Wharfedale still had 15 men on the field! The mix-up was soon sorted and play resumed its procession of penalties and scrums the highlight of which for the home supporters was a powerful break to the Wharfedale 22 by James Fitzpatrick. A turnover and the inevitable penalty took the visitors to the half way line where a chip from the lineout moved them down to their hosts’ 5m line and a yellow card for Gough. As Wharfedale pressed the Hoppers’ line, Ally Murray was also yellow carded. With the clock in the red, Hoppers were defending with thirteen players and although Wharfedale drove the line, the ball was deemed to be held up and the players went in with the score 14-0. In the heavy rain Hoppers had made a lively start and at times Wharfedale didn’t seem to have much in reply. The home forwards were strong in the scrum and had driven their opponents almost at will. The backs had moved the ball well with the centres making telling metres throughout the half. The visiting supporters were somewhat subdued as the teams returned to the pitch and as the rain became even heavier things did not look too rosy for the Yorkshiremen. 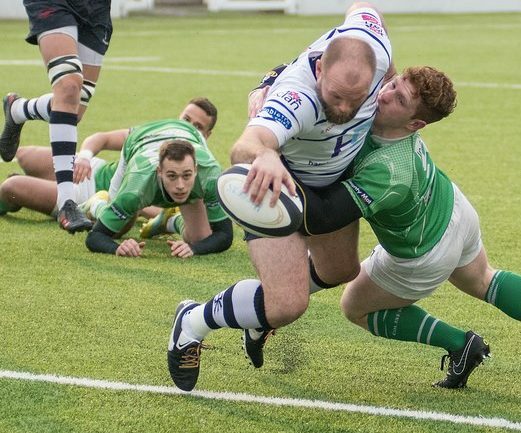 With Hoppers still down to thirteen players, they started the second half kicking deep into Wharfedale territory and defended well as the visitors moved up the field only conceding three penalties in the first seven minutes. However, from the last of these, Wharfedale kicked for goal from just eighteen metres out and put their first points on the board. Whether they were buoyed up by that score, or revitalised by their half time chat, Wharfedale were a very different team in the second half of the match. They looked much sharper and ran the ball powerfully as Hoppers’ dominance faded. Despite this, the game proceeded much as it had it the first half with both sides attacking, only to be denied progress by penalties. From one of these Wharfedale moved up to the Hoppers’ 22. They managed to put together a series of phases without penalty and scored their first try on fifty-nine minutes (flowing rugby at last!). As a result of a no doubt erudite exchange of views between Wharfedale’s number eight Burridge and Scott Jordan, both players were sent to the sin bin and although the conversion failed, with ten minutes of the match remaining, the visitors were now within a score of taking the lead. The turning point came when a strong clearing kick by Nathan Pope was intercepted ten metres in front of him by his opposite number and incredibly, in what would usually be a charge-down, the ball stuck in his hands and with the field open in front of him he crossed the line to score beneath the posts. The conversion was good and for the first time in the match, Wharfedale were in front albeit by only one point. Hoppers pressed on and despite Wharfedale’s baying supporters, continually attacked deep into their opponents’ half. A break from Gough took them down to the 5m line where a series of phases saw them pushing towards the try line. Wharfedale held out and play moved back towards the half way line. In the dying seconds Hoppers were awarded yet another penalty. The decision was made to go for the three points but from eight metres inside the Wharfedale half, in the driving rain, as the ball fell short the whistle signalled the end of the match and the slimmest of victories to the visitors. Coach Arnold was fairly sanguine in his post-match interview. ‘We needed more in the first half whilst we were the stronger side and we should have got the extra point. The yellow cards didn’t help and thirty-two penalties didn’t give either side a chance to make the game flow. The lads put in a really good shift and whilst Nathan’s decision to kick out was absolutely the right one, it was unfortunate that a ball that would normally bounce away was held. By gaining a losing bonus point today, Hoppers maintain their position at ninth in the table. Next week’s trip is to Macclesfield and there is a supporters’ coach arranged so let’s get behind the team and help them get some points.